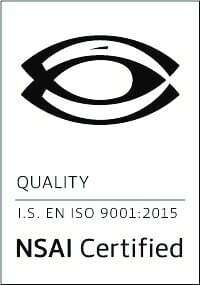 The high quality of planning and technical services on renewable energy projects at Galetech Energy Services (GES) has been deemed to meet all requirements of ISO 9001:2015. Certification by the NSAI auditing body in October 2017 has enabled GES to continue striving for customer oriented project development and service provision. When any renewable energy project is finally commissioned, it is the end product of may years of preparation involving countless workflows and procedures with many crucial decisions that influence both the quality and profitability of a project. For this reason, GES wanted to have its quality management system certified by a third party and use this process as a yardstick for constant improvement. In a complex adaption procedure that stretched over various months, organisational structures, interfaces and workflows have been listed, optimised and aligned within the requirements of the ISO. For daily work, this means a clear assignment of responsibilities, a binding procedural structure, and a systematic and permanent documentation of knowledge. In terms of competitiveness, the certificate yields a vital edge; along with good support and custom-made services, investors and service clients always expect transparency at all stages of the project. ISO 9001:2015 sets out the essential requirements for a practical and effective quality management system (QMS) which is, in essence, a system for minimising risk and maximising opportunity. ISO certification is voluntary and requires a successful auditing procedure. The certificate confirms that GES fulfils the required standards of modern quality management systems. Follow-up audits on an annual basis ensure that these standards continue being met in everyday practice.